This Duesenberg is a Model JN – that is, it is one of 10 Rollston-bodied cars produced in 1935 with modern updates to the front of the car along with smaller wheels. 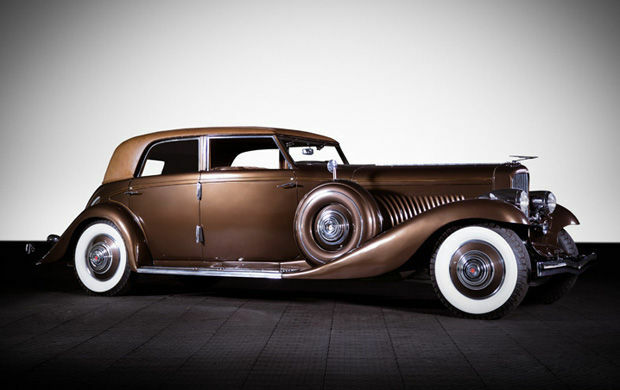 They were among the last Duesenberg’s built at a time when the company was desperately trying to stay afloat and keep its aging flagship car relevant. As was the case with JNs, this one came equipped with Rollston bodywork. This chassis and body originally had engine J-559 underhood, but that was replaced in the 1950s when its owner consolidated two different Duesenbergs. This car also received the larger Model J wheels at that time. The engine was unchanged – a 6.9-liter straight eight making 265 horsepower. This car was delivered new to Bill “Bojangles” Robinson, the famous Hollywood tap-dancer who appeared alongside Will Rogers and Shirley Temple onscreen. When he took the car to California, he sent it to Bohman & Schwartz for some updates (only a year after purchase). When he passed, the car bounced between owners – its engine being swapped out along the way. It was restored in 1970 and has been maintained since, which is kind of remarkable considering its fairly nice condition and the fact it has covered more than 100,000 miles in its well-used life. It should sell for between $500,000-$700,000. You can read more about it here and check out the rest of Gooding’s auction lineup here. This entry was posted in Uncategorized and tagged 1935, 500, berline, bohman & schwartz, cars, classic cars, duesenberg, gooding & co, lwb, model J, model jn, rollston by ClassicCarWeekly. Bookmark the permalink.